Having followed Centrals since I was six, I had a fair idea off the top of my head about who the key interstate recruits were, but the fun was in discovering some of their back stories. I also found out about some blokes who I had either forgotten, or never knew, that they weren’t natives of beautiful SA Great. When Centrals commenced in SANFL league ranks in 1964, it supplemented its local ranks with a few blow-ins. Ex-Richmond Tiger Alan Hayes, a product of Melbourne’s bayside, wore number 20 in the Bulldogs’ first game, scoring one of the new team’s few goals. 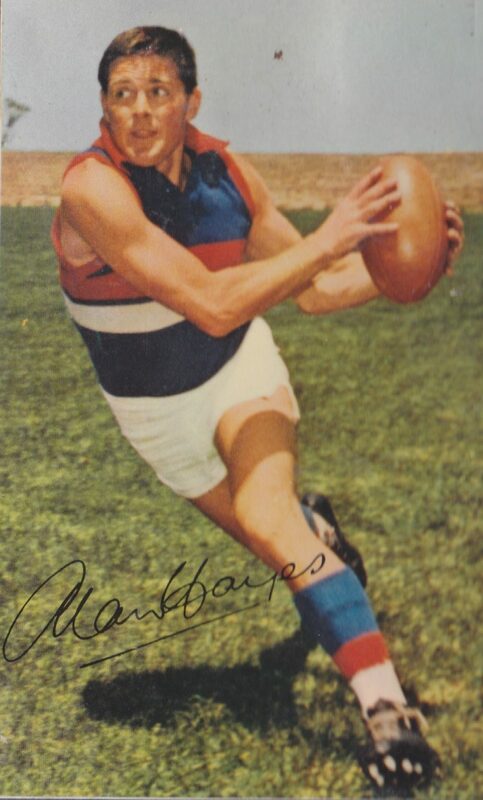 Hayes was a Centrals mainstay during his three valuable seasons (51 games, 14 goals), also achieving ephemeral immortality as a member of the 1965 Mobil Footy card collection. Hayes gave plenty back to footy upon his return to Victoria as detailed in this Tigerland Archive reference, including a term as President of the Mornington Football Club and looks back at his time at Elizabeth with a great deal of pride and affection. Jock O’Brien strung together 33 league games at North Melbourne, winning the kiss-of-death Gardiner Medal in 1961. He tried his luck at Elizabeth in 1964 and played 19 games in his only season, after a successful sojourn with Ulverstone in the NWFU. A year later, Doug Ion, younger brother of Footscray’s Graham and Barry, moved across from Victoria, playing three games, including Centrals’ first winning game. In 1965 Centrals looked to the West for its first big interstate signing, South Fremantle’s onion picking Tom Grljusich. A kerfuffle over residency qualifications, resulting from a brief return to his home town to get married, saw the vigorous Sandgroper key position player having to wait ten weeks for his SA Bulldog debut. He was an immediate hit, being selected for his adopted state after only three club games and helping his new club win seven games from round ten onwards. In the following year, he won the Dogs B&F and was a Croweater standout in the 1966 Hobart Carnival. 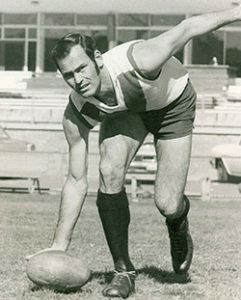 Tom returned to his old club after taking out Centrals’ goalkicking award in 1967 and continued at South Fremantle until he was in his late thirties. Another westerner, rover Peter Medhurst, had to stand out of footy in 1964 before the West Perth triple threat (1960 premiership player, best and fairest and top goalkicker) got his chance at Goodman Road in 1965 and 1966. 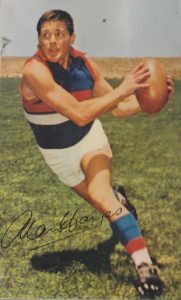 Dennis “Dinny” Barron was a stout defender from Subiaco whose two years (65/66) at Centrals yielded 32 games and 46 goals, indicating that he was more of an on-baller for the Dogs. Keith Shorthill came across from East Fremantle, taking Medhurst’s spot as the designated ex-WA rover in 66/67, continuing Centrals love of nippy Sandgropers. Darryl Beale played ten games at Richmond before lobbing at post code 5112 in 1969. Beale was a no-frills utility during his nineteen games at Centrals. He went on to become a famous name in local footy north of the Torrens, at Angaston, Tanunda, Eudunda, Gepps Cross and Elizabeth as a very successful player and coach. 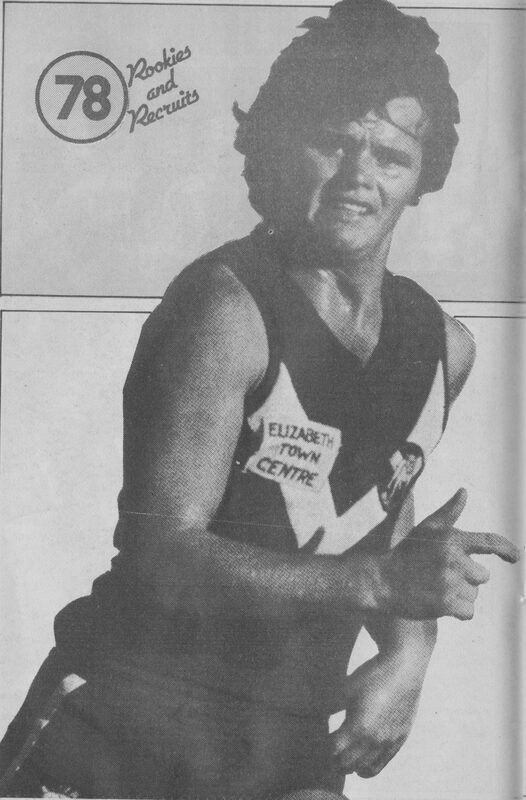 As mentioned here , Centrals were fortunate to land Tony Casserly from East Fremantle in 1970. TC became an instant hit around my neck of the woods when he took over Brian Dickson’s deli at Elizabeth South, where he became my favourite providore of Amscol Footy Colours and the briefly popular Woodies Woc. He was a pretty good coach when appointed in 1972, but the gloss seemed to fade a bit and he was replaced (unbelievably, in hindsight) by Garry Window after four seasons. Casserly’s laser like handballing became a feature of the club’s game plan and he also represented his new state on a couple of occasions. Tony currently works alongside Centrals’ multi-flag winning coach Roy Laird in the real estate game that has been his specialty since the mid-70s. Gary Jones was the coach’s nephew when he came across from the Melbourne suburbs in 1970, but gained an instant following as the proverbial “man mountain” in front of the sticks. He was huge, immoveable once he stuck out his big frame. Centrals fans would holler with enjoyment at the sight of four opposition backmen trying to get near the incoming Ross Faulkner as Jones stuck up one or both of his big mitts to take a one-grabber in the square, holding it aloft for a few seconds, just to frustrate them even further. The biggest dob I ever saw at Elizabeth was his prodigious drop punt to the southern end goals, from the boundary line north of the coaches’ box. Twin calicos and disbelief all round. The first in a long line of cult heroes at Goodman Road. Another WA recruit, Phil ‘Cracker’ Haughan was an ungainly but highly effective ball magnet from East Perth. It took Russell Ebert to beat him in the Magarey in Haughan’s debut year 1971 and it was no coincidence that Centrals made the final four in his first two seasons. He was off to parts unknown after the unsuccessful 1973 season, bobbing up at Launceston where he won every award possible during 76/77, including a flag, before a final stint with Swan Districts. Phil Ashmead was a pint sized blonde rover from the Melbourne suburban ranks, playing generally as a second rover from 1973 to 1977. His 47 goals included several “Viscount Goal of the Day” awards, but he spent as much time in the seconds as he did the league. His lack of kicking power was in part compensated by his fearlessness. He finished his SANFL career at Thebarton and remained in Adelaide to become “one of Adelaide’s best connected businessmen” according to his current employer. 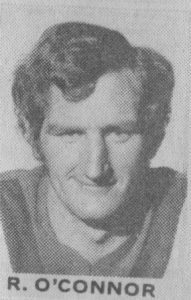 Adrian “The Bear” Hunt joined Centrals in 1973 (from the VFA, I think), but the bearded and bulky left footer couldn’t command a regular spot, so transferred to the Eagles for two more seasons. He did his best work a few years later when the SAFA commenced, playing for the green and white Bulldogs of Ingle Farm under Maurie “Excuse Me” Francou. 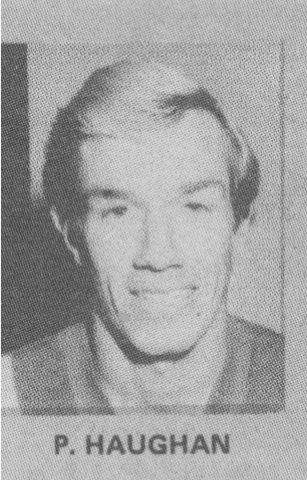 The WA connection continued in 1974 when Graham Ramshaw (Perth and briefly Fitzroy) arrived in a late career move, which only yielded three games. Hawthorn provided the Dogs with another Victorian archetype, Gene Chiron in 1974. Tough as nails, he was a valuable member of Centrals half back line and occasional CHF, until a career ending “encounter” with West Adelaide’s Ray Hayes caused him to lose a kidney. He remained at Centrals as an assistant coach/fitness coach for a couple of years after that before returning to Victoria, even playing a few years for Mulgrave in the EDFL wearing a protective guard. 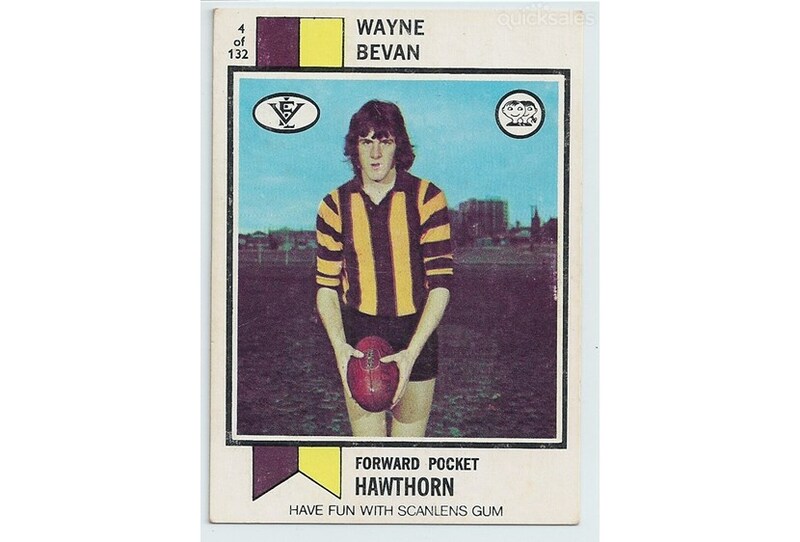 Wayne Bevan was talked up as a boom recruit from the Hawks in 1976, already a semi-legend due on the back of his ballistic-grade torpedoes (or screwies in SA vernacular). He had more touches one afternoon in a long kick playoff against Norwood’s elegant Noel Pettingill (which we witnessed after school at the Ponderosa, and he lost) than in his 18 games in his only season. From Fitzroy (via Coragulac in the Hampden League) came Danny Harrington, another typical VFL utility. Harrington did well enough to get picked most weeks but never enough to turn a game, playing from 1977 to 1980. The SAFA competition, in particular the Pooraka Bulls then welcomed Harrington as a coach and he soon rewarded them with a couple of flags. Max George effectively replaced the combined Gary Jones and Graham Reed scoring contributions when he arrived mid-season in 1978 via Swan Districts and briefly, Fitzroy. Despite the late start, George piled on an impressive 68 goals in 1978 (including consecutive bags of ten), before injury problems curtailed his appearances (he missed all of 1980). He left for a brief appearance at Thebarton during the 1981 season, not before snagging 120 majors in just 33 Centrals games. From Swan Districts, it was Michael O’Brien’s cricketing ambitions that led to him ending up at both Salisbury District CC and Central District FC in 1978. His Footy Budget profile in 1978’s Rookies and Recruits season had his football ambition as playing 100 league games; he got to 69 games (and 3 goals) in his four seasons. While Centrals president Peter Page was in Perth recruiting Gillies from East Perth, he stayed at a pub managed by then West Perth captain John Duckworth. Next thing, Duckworth came, saw, elbowed and conquered the SANFL in 1979, spearheading Centrals’ first Minor Premiership (note the capitals), snagging the Magarey and causing opposition clubs to adopt brown shorts to avoid embarrassing match day laundry incidents. 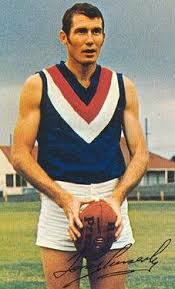 A Vietnam Vet, he took no prisoners and it was a privilege to have witnessed the 1979 season from the gun who started his senior career at Fitzroy. A bad kidney injury at the start of 1980 saw him struggle to regain form and West Perth beckoned once more, but in two seasons, “Whatsa” wrote himself into Bulldog footy lore. South Melbourne’s Michael Wright was part of a three way deal that saw Peter Jonas join North Melbourne and Wright (plus $60,000) come across to Elizabeth in 1981. He was a hit straight away, making the SA state side after just seven matches. 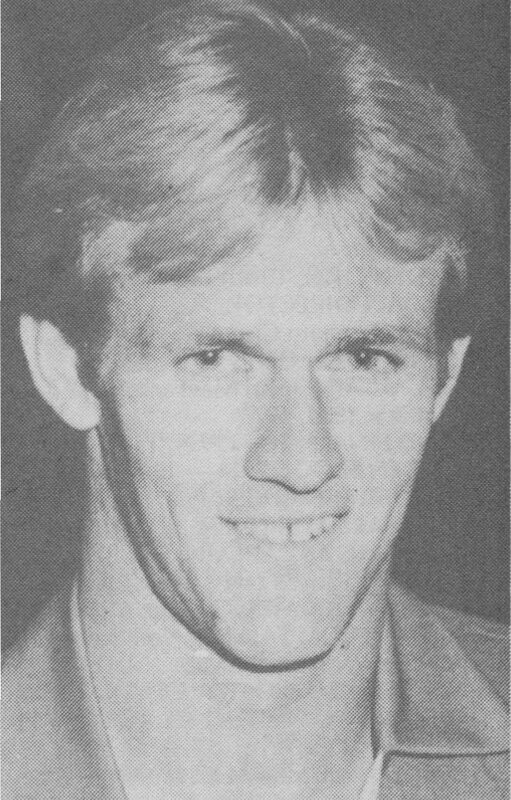 Wright’s 60 games, mainly at CHF yielded an impressive 165 goals, but it all ended in tears when he moved to the Roosters in 1984 after a pay dispute. His brother, Steven Wright coached Centrals to a Grand Final loss in 1996 and a PF loss the following year. 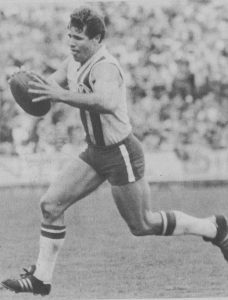 In 1982, Neil “Racehorse” Besanko played the role as Centrals’ designated ex-VFL strong man after fourteen seasons with St Kilda and Essendon for 21 games. In true “blow-in/blow-out” style, that was his only season in Adelaide, the lure of a long-term career in civil engineering probably more attractive than the long drive home along Main North Road after training. Grant Edwards had amassed 21 games in 6 seasons with Swan Districts and East Perth before heading east to Elizabeth, where he put together that many and more in two seasons, before deciding that he was tired of being mixed up with Greg “Meggsy” Edwards and heading back west. Alan Casserly blew across from WA in 1983 as a young twenty year old, but was back home after a year and five games with Centrals. From the ACT came Ainslie’s Brett Hannam, as part of Cowboy Neale’s appointment as coach in 1984. Hannam replaced Steven Trigg as Captain in 1985 (hear, hear) and was a popular player in his three seasons in the world’s most adventurous footy jumper. He went back to Ainslie in 1987, and was inducted into the ACT Sport Hall of Fame (alongside James Hird*) in 2012. Hannam’s Ainslie team mate, on-baller Stephen Nolan came to Centrals for the same three seasons, lasting longer than another Ainslie-ite, David Bellchambers, who only played in 1984. Darren Grant’s one game for Footscray in 1982 followed by his five games for the SANFL Bulldogs in 1984 qualifies him as a blow out of a blow in, although he went on to play 48 games for Woodville in the latter part of the decade. 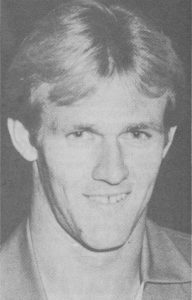 The most memorable part of Melbourne reserves fixture Bruce Joycey’s brief appearances in 1984/85 (8 games) was, well nothing, actually. With Centrals best ever home-grown player John Platten becoming a VFL Hawk in 1986, a few players came the other way in the mid-80s. An all-time favourite was Yallourn’s finest, Scott Lee. He mightn’t have been the most skilled bloke going around but he was, in racing parlance, as honest as the day is long. He won Central’s B&F in 1987 and again in 1990 (he was also Magarey Medal runner up that year). I know that this is about the SANFL, but geez I enjoyed his 91 games for the Crows as well and was pissed off greatly slightly miffed when he was delisted after the 1995 season. If only he could have played in Centrals 2000 flag. Russell Shields was another Hawk, whose star shone briefly at Elizabeth from 1985-87 on a half forward flank, before having another crack at the VFL at Footscray. Grant O’Riley continued Centrals tradition of taking ex-Fitzroy players and quickly turning them into ex-Bulldogs, his sole season 1985 at Goodman Road producing 7 games and 15 goals. He returned to SA as a VFA rep in the much revered 1988 Bicentennial Carnival. East Wagga’s Mark Hull left for the only slightly bigger smoke in 1985, hanging around for four seasons and 38 games of stout defence, before returning back home. Scott’s brother Ron Lee joined Centrals in 1986, playing just three games (which was three more than I ever managed). Centrals had better luck with former VFL Lion and Swan Craig Braddy, who introduced a bit of old fashioned footy mongrel as a robust and dependable key position player from 1986 to 1989. Braddy returned to Victoria, taking on several administrative roles in local footy. David Flintoff was a (very) fringe rover at Hawthorn, but weaved his magic at Centrals for a couple of seasons (86/87). A somewhat hurried departure saw him decamp to the VFL Demons. Another ex-Hawk listed player from an exotic Victorian locale was Poowong’s Rudi Mandemaker. He became the cultiest of cult figures, snagging the club goal kicking award from 1986 to 1991, the Ken Farmer award in 1989 and wearing SA state colours thrice. A bad ankle put an end to his time at the Dogs, but the cries of “Ruuudddiii, Ruuudddiii” can still be heard echoing around the expanses of Elizabeth Oval each winter (if the wind is blowing from the north). Ian Anderson was a Queenslander who spent the ’86 and ’87 seasons in the colder climes, scratching together 8 games and a couple of majors. No, me neither. His namesake, Stephen ‘Shorty’ Anderson popped across from Warrnambool for a successful season in 1987 (36 goals from 17 games) before blowing right back to where he came from. 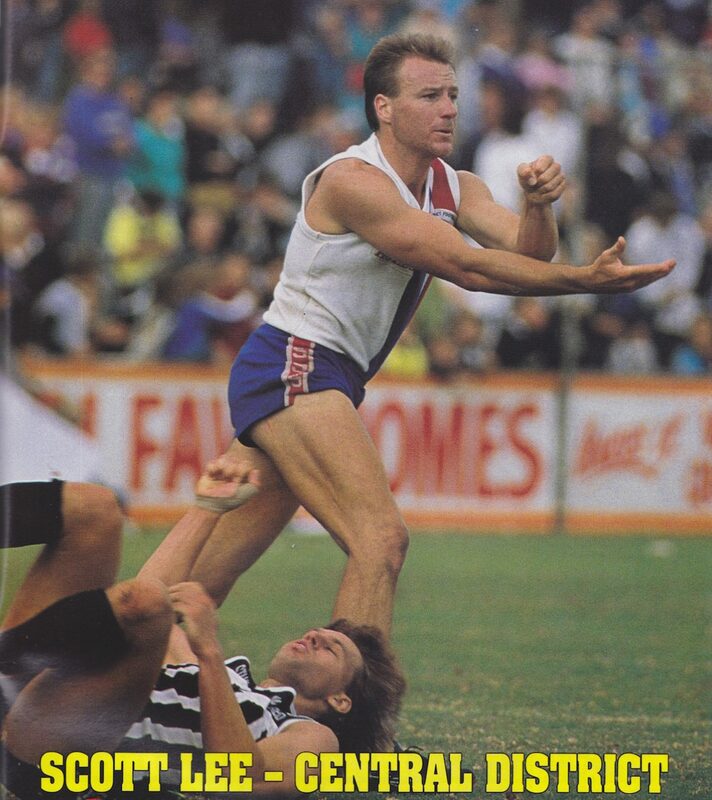 Collingwood must have liked what they saw as they gave him a four game run in 1991 (and he won their Reserves B&F). He is a legend at South Warrnambool FC, with over 300 club games, 25 interleague matches and three flags to his credit. Another 1987 recruit was Greg Smith, who arrived with an impressive record at Sydney and Collingwood. Smith was immediately welcomed into the Centrals fold, his fierceness on the field was balanced by his off-field popularity. He was awarded the B&F in 1988, was made captain in 1991 before retiring through injury in 1992 after his 100th club game. The Riverina Team of the Century player remains a much revered player at the Dogs. With a single season under his belt with Perth, Steven Lally added himself to the list of WA little blokes at Elizabeth in 1987. The high point of his three seasons as a Bulldog was not to be found in his 52 games, but on the Channel 9 Footy Show where he proclaimed that Centrals were known as the Doggies due to their ability to overhaul last quarter deficits (or something along those lines). Somehow Rod Grljusich (South Fremantle, then Perth) made it across in 1987 to play for the club that his uncle Tom had played for in the 60s, for four games and a goal. He returned to WA for a few seasons before continuing the family tradition as the voice of USFooty. Jed Lawton was a lump of bloke whose last known address was Currumbin when he fronted at Goodman Rd in 1987 for a dozen league games. He was one of a very young Wayne Carey’s first opponents at Reserves level (and got a bath according to Carey). Lawton and his son (who also played a few games at Elizabeth in the 2010s) are in a bit of strife with the Riverina Football League currently. Greg Page came down from Coorparoo in 1987, perhaps in the same panel van as Lawton. Eight games and three goals later and he was off again. Michael Smith, who made a handful of 1987 appearances remains a bit of a mystery man. He is listed by the Football Times as having Kalamunda, WA as his previous club. The arrival of Neil Kerley as Centrals’ coach in 1988 coincided with several new interstate recruits. Derek Kickett was a match winner from the beginning. Derek Kickett who had played for both West Perth and Claremont lobbed at Elizabeth after the disappointment of being ineligible for the Sandover Medal despite amassing a 16 vote lead. Kickett, who was not technically a blow-in as he had played in Centrals junior ranks in the early 1980s, was astonishingly good, as his 48 goals from 25 games would indicate. VFL ranks awaited Kickett thereafter. Joining the list of ex-Hawks was Robert ‘Chopper’ Handley, who blew in for the 1988 season, before blowing back to the Saints for a season, before re-blowing in for the 1990-93 seasons, totalling 111 games and 133 goals in his five seasons as a very popular Bulldog. Centrals’ fascination with WA rovers continued when goalkicking rover Gavin Chaplin came across from West Perth, also in 1988. Chappy played out his career until 1993, racking up a prolific 142 games/201 goals, then served Centrals for many years as an assistant coach. 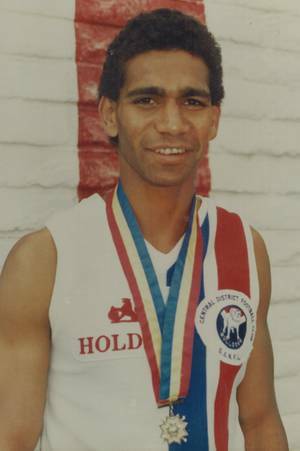 Gilbert McAdam, who grew up in Alice Springs, had already played briefly in the WAFL (Claremont 1986), before breezing in to Elizabeth in 1988. (He had also played for North Adelaide’s under age teams for a while, but I’m counting him anyway). 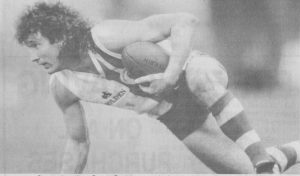 He stood West Torrens’ NT recruit Michael Long in a pre-season game, relished the expanses at Elizabeth and finished runner-up to Greg Whittlesea in the 1988 Magarey Medal. Not content with that, he knuckled down under Knuckles to win SA’s top footy award in 1989 (the Centrals B&F) as well as the Magarey Medal, playing out one further season before joining the Saints, then the Bears. 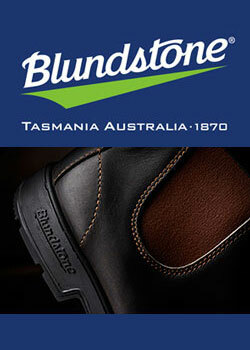 He has since kicked on as a popular member of the Marngrook Footy Show panel. Paul Sullivan didn’t notch up a senior game with North Melbourne, but was a first team fixture with Centrals in 1988/89 in his 45 games. Melbourne reserves player Brett Minchington found him self in a similar role for Centrals, his 1989/90 tally of 8 games telling that tale starkly. Peter Wright, well I have to come clean and admit that I don’t remember this former Footscray player’s solitary Centrals appearance in 1989. One of Centrals’ earliest Queensland recruits was Morningside’s Tony Lynn who fronted in 1990. Cast aside by Brisbane after one season (1988), Lynn was a tremendous addition at Elizabeth, winning the 1992 B&F. So good that, when he was named BOG for SA in 1993, he was snapped up in the AFL mid-season draft by Carlton and never seen again in the red white and blue. Williamstown’s Saade Ghazi spent a busy season in 1990, notching 40 goals in his 25 games, bringing his 1989 JJ Liston Trophy form to Elizabeth. He returned to the Seagulls after just one year, gaining Team of the Century honours. Defender John O’Sullivan was the latest in a fairly long line of East Fremantle players who played for Centrals, when he joined in 1990 for what was his only season. Dale Holmes played three games for North Melbourne in 1987 before coming to Centrals for two seasons in 1990/91, but he is better known as the first, short-lived GWS Giants CEO. I don’t remember Steven Newman at all, but his two games for Centrals in 1990 was double his tally of games for Fitzroy in 1988. Centrals did more than OK with their interstate recruits over the time frame selected (based on their blow-in year, not necessarily the year of the honour), apart from the lack of premiership players. A decade down the track, a pair of brothers from Anglesea and a Tasmanian captain (amongst others) helped open that account. 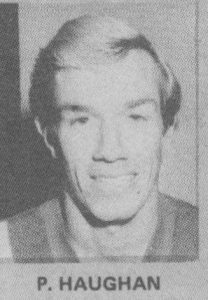 I’ve used the first SANFL club to classify a blow-in’s club (for example, this precludes Bruce Stevenson and Bill Nalder from the Centrals list). But I’ve also taken some licence when it suits, such as Derek Kickett or Gilbert McAdam. 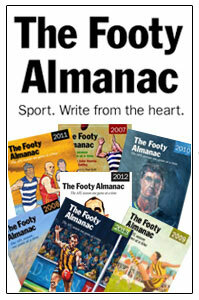 Rightio you Doggies, you may well have a soft spot for the Western Bulldogs, so have a look at The Doggies Almanac. No wonder I never was good enough – Craig was an interesting influence! this was the early 1980s ! Neil gave me some feedback you’d call it these days about application and workload. Thoroughbred royalty – David Hayes ! John ‘the great man’ and get a hair cut Platten – played all the underage trials – the first game on ’81 after being promoted to the senior team, played reserves round one and league round two. I played Perth Sunday League with Alan Casserly. Big, fast, and could have been a name, had he been interested. Steven “Sheepskin” Lally was from the Avon league (Northam, etc) and played a year for my first club the Wickham Wolves. If he had arrived one year earlier, we would have won the flag. Pretty sure he’s now in real estate down the south west of WA. And Dinny Barron is a bit of a legend down Narrogin way where he played for Towns and where he is famous for his courage. Thanks Tony, just the sort of bonus insight that I was hoping for. Quit the research project Swish. Yep, those Victorian twins down the track – the finest bit of recruiting Centrals ever did. Ran across one of them a couple of years back – he was doing the tiling in a men’s loo in a city pub (not a euphemism). Was such an unexpected encounter I had absolutely nothing to say (it’s difficult to express grudging admiration while spending a penny). Loved big Rudi. Great work Swish. Can’t wait for the full feature on the Gowans Bros. Inc! Great article Swish. Remember a lot of them. An interesting fact about Tony Lynn – played in 4 different jumpers in 4 consecutive weeks – I can’t recall the order, but CDFC, Carlton, Qld, SA. 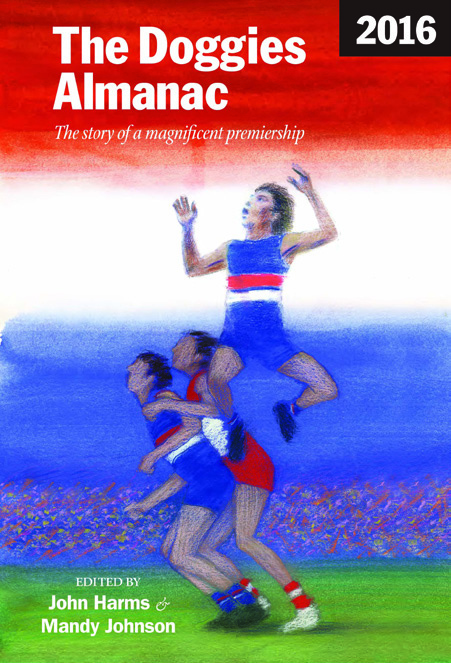 I had a good talk with Tom G at Fremantle oval a few years ago about CDFC days – he recalled them qith quite some joy (and JD reckons he REALLY enjoyed them!). Tony Tea – I saw Wickham Wolves play Dampier Sharks in the 2015 Prelim. You know the rest. Ta Phil, since I only saw the twins once or twice in the flesh, there are probably others better placed. 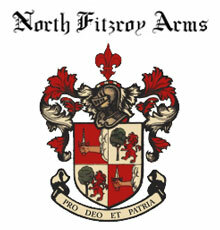 I could probably do the Norsworthys though. Rabs – Daniel Healy posed that same Tony Lynn question today – I think the order went Centrals, SA, Qld/NT combined, Carlton. Tom G played in the first Centrals game that I saw. Swish I must say this is the most family friendly use of the phrase “got his chance at Goodman Road” I’ve ever seen. Didn’t Phil Ashmead and Adrian Hunt both come from Preston not long after we played them in an away game in the old interstate cup? Geoff Gillies was a regular feature in the Tiser/Harris Scarfe adverts for mens wear if I recall. I am sure the Max George two bags of 10 were kicked in back to back weeks. I also recall a Phil McEvoy being flown in to great fanfare at one stage for a tremendous game or two! Too many favourites in here to talk about but the “Michael Wright, Michael Wright” chant followed quickly by a robust “Wilbur Wilson walks on water” will stay with me to my grave…………..and most likely be sung at my funeral. John O’Sullivan’s daughter Gabby is on the Fremantle Women’s list. I once went to a home open in Doubleview because Phil Haughan was the agent… fine player for the Royals. Culls, trust you to find my omissions. I know Hunt and Ashmead were a package deal, but wasn’t exactly sure about which club. You are correct about Max George. My decision not to filch photos from the Poms To Premiers cost him a photographic slot here. Thanks for that Les. I’m pretty sure that Centrals leads the pack as an SA attraction for Sandgropers. Swish – You forgot my flat mate Craig Earnshaw – had lunch with Granty (CEO Kris Grant – the one his been promising since ’04) today – and spoke about why he let a couple of country lads ( trying to play underage football at the Ponderosa) stay with him. Interesting education for my younger brother, Beatle and myself! In ’82 remember Neil Besanko giving me a lecture about what you now days is called work ethic? As did Jamie Thomas who rocked up half way through the year. Phil Graham and Richard Cousins came back for a game during the season. Notice they all played SANFL league football – except for Hayesy (had a handy sporting career0, Tony Holding and me! At our end of season footy trip (after the flag) was to Moonta on the October long-weekend Our captain and one other was thrown in the lock up for stealing garden gnomes . That’s what I can tell you about! Magnificent memories there Peter, thank you. Glad to see a couple of Elizabeth South lads get a mention (O’Neill, Barilla). I have a photo of Peter Collins (on crutches) at my 21st, the first and only time I ever met him. I played on Geoff Robertson in my first game for Eliz Sth Primary (v Eliz Grove), but didn’t get a sniff. I always got a laugh out of the fact that Ray Roe (Trevor’s father) was the arch-nemesis of my father in law at the Adelaide Mail Exchange. Peter and Swish- as has been well-documented many folk love to see Brendan Macguire referenced. Indeed, one could argue that BM is Playing Quite Nicely was a Footy Almanac prototype- albeit produced on an inadequate home photocopier. Was Rudi the Grenville of Centrals, or the other way around? Ripper, Swish. This series is going to be great over the next few months. Craig Earnshaw only played 59 games for East Perth but he was a brilliant defender who would have been suited to the modern game. He played in the 1978 premiership team. Would love to hear what he got up to in SA as I didn’t know about it. Graeme Ramshaw was very interesting. 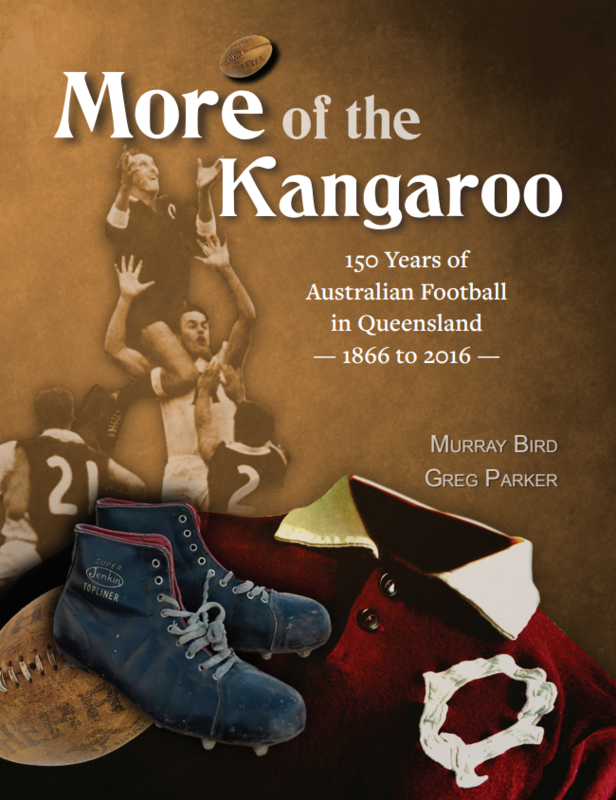 He was full forward in Perth’s 1966 premiership team and full back, noted for his beautiful drop kicks, in the 1967 and 1968 flags. David Flood came to Centrals from Essendon in the early 90s. I think he twanged his hamstrings more than games played. And great to see Brendan Maguire mentioned. “Brendan Maguire is Playing Quite Well” (or BM for short) was defintely more of a blowhard than a blow in. Swish as some one who helped ( was forced ) to help,Chocka with research for the history of amateur league book I truly appreciate how much work and research has gone in to this article.Greg Smith coached the Adelaide University FC farmers side and he was fantastic the farmers had more than a couple honest battlers to say the least,Greg fitted in to the uni footy culture like a hand n a glove. Thanks Mickey – the Bays will be my next project. Grenville may bob up when I get to the Roosters. Hey Peter, whatever happened to that website that had all of the BM’s on-line? Did KG make you take it down? Flood played in 96/97, after my cutoff. Luhrs, Potter, Wynd were others around that time. Appreciate that ‘Book, but I can assure you that no microfiche readers were harmed in the making of this article. Wow, thanks Beefy (if I can call you that still), I stand corrected. As discussed yesterday, I’m pretty certain that TC has retired from the real estate game. However, his youngest son, Nathan, is now very prominent in the industry. Nathan was also the team runner through much of the Dogs’ decade of dominance. Eldest son Justin played league for Centrals, as well as collecting a junior medal and a reserves Magarey. He later transferred to North. I loved watching Chopper Handley and later played on him when he was at Renmark. I once had to stand him, which was a challenge for many reasons and he growled at me with his shark-like grin, “what are you doing here, Robbie, you’re too old for this”. A bit of pot kettle. He was a coach at Renmark and worked as a cop in the Riverland, also having an interest in a funeral parlour – kind of apt given his fearsome footy style. Scott Lee has just finished up as coach at South Gawler. I currently play cricket with him at Trinity Old Scholars. I’m not sure how many TOSers at the club can remember him playing for Centrals. He’s got a very dry sense of humour. I didn’t realise Bealey had come from Richmond. It explains why his son Damien is such a Tigers tragic. I used to play against Berri sides coached by Michael Wright – a straight shooter. He didn’t meet much success with the Demons but last time I saw him, admittedly a while ago, he was still living in the Riverland and selling wine. Greg Smith was another of my faves. I’m certain he’s read this article too – he’s certainly aware of it. Thanks for those details Rob, you’ve certainly fleshed out some blokes who I’ve only known from the other side of the fence, usually at the Southern end, near the huge gum trees. And check this out, a recent shot of TC, Cracka and Whatsa with some local Centrals royalty. Good read Mark. 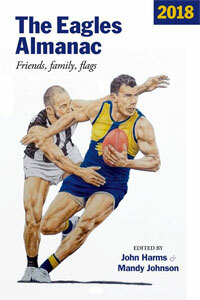 Is “The Footy Almanac” going to be put into book form? I hope so, I’d love to buy a copy. Great reading. Have watched the doggies since 1969. 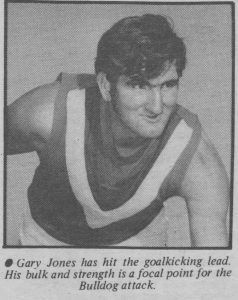 I remember being on the grandstand side of the ground when Gary Jones kicked that boomer between the sticks! And who can forget the way John Duckworth took games by the scruff of the neck and lead us to some amazing wins. Rank him as the best player I have seen. As for the Gowan brothers…there should be a statue! Thanks for the read! Max George’s consecutive 10-goal games in 1978 is one of my earliest footy spectating memories. I still have a vivid slice of mental video footage, George on the lead, taking a chest mark at full pace in textbook style with knees raised. I was impressed enough to have his number, 48, sewn onto my first Centrals guernsey (unfortunately probably one of the last sold before it was superseded by the groundbreaking 1979 mainly white version modelled by Geoff Gillies, John Duckworth, Gilbert McAdam et al. above. Thanks Wayne, hope you find that Budget from 1970 one day. Michael – I’ve managed to convince myself that I was standing just behind big Gary when he kicked that monster, but I’m not 100% sure where I was. I know I was there when he was a big part of that comeback in time on against the Bays in 1977 at Elizabeth, the highlight of a lamentable season. No, thank you. Mark D – What a number to have to sew on. I still have a soft spot for that guernsey too. It was superb as a laceup. Max George kicked 10 against North on Jun 5th (Queen’s Birthday holiday) then buttered up the following Saturday Jun 10th with 10 against the Peckers, both at Elizabeth. That game against Glenelg would have to be one of my oldest, fondest footy memories! We got up by 3 points, if I recall correctly, over the mob that made the Grand Final that year. This was almost certainly the moment crystallising the notion that we were always a chance going into the last quarter at Elizabeth any less than five goals down (and that Centrals would win if I turned up to watch, irrespective of ladder position – alas I was disillusioned on that score all too soon). What a brilliant tribute to a club that seems a magnet for characters – on and off the field. I heard when Casserly coached the Dogs he had an X painted at each end of the ground. He told Gary Jones that when he looked up and saw Casserly, Milky, Mobbs or Skinner with the ball he should just run to the X where the ball would find him. Wasn’t so effective in the wet when Jones couldn’t locate the cross. Don’t know many of these names Swish, but did see Shorty Anderson play for Collingwood and quite a few times for South Warrnambool. 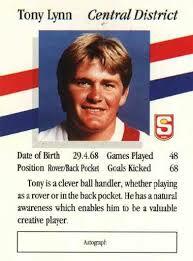 Think he may have also won the AFL reserves medal in 1991 (Gardiner medal???). Absolute legend of the Hampden League. Surprised to read Centrals only started in the SANFL in 1964, were they a new or existing club when they joined? Thank you Michael – only nine more clubs to go. It might be finished by 2018 at this rate. Well spotted Luke re Anderson, I should’ve mentioned that. Interestingly, the last two winners of the Gardiner (Healy and Arnott) went on to be premiership players at Centrals. A couple of earlier winners will also be getting a guernsey as SANFL Blow-Ins later in the series. Centrals and Woodville were “expansion teams”. Centrals was newly constituted, based around the satellite city of Elizabeth and areas to the north, but Woodville originated from an already existing team in the ammos (http://australianfootball.com/clubs/bio/Woodville/328). The new clubs played in the SANFL seconds from 1959-63. Just took delivery of the Budget from the first ever Centrals final I attended, the 1971 Prelim v Port. The Gary Jones pen-pix are worth repeating in part. I’m going to see if I can confirm his time at Richmond. He obviously didn’t play a senior game there, and there is no record on tigerlandarchive.org of him playing in the reserves. 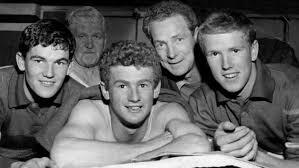 And he would have been about 14yo during that time at Aspendale, which ties up with him winning the thirds goal kicking in the Ellinbank League in 1966. I am trying to remember a player for Centrals from I’m guessing around 1980’s who I played golf with at Tea Tree Gully Golf Club, he was a giant of a man with the biggest hands I have seen. When we were hitting woods he was hitting 5 irons. A friend of mine who was a SANFL umpire was asking me who he is and I cannot think for the life of me. I know that he was or is an upholsterer in either Salisbury or Elizabeth. Any info would be appreciated. For the record, Garry realised that it was Peter Maksimovic. As the son of Alan Hayes who is mentioned at the top of this post I feel like I have to comment on this. While looking for the trading cards of both our Grand Father and Father my sister and I came across this website, which of course we showed to Alan. The reaction to this post wasn’t what I expected, as months later it is still on my fathers mind. You see he takes issue at being branded a ‘blow-in’. To be branded as a ‘blow-in’ who “stayed around for three seasons…” and reduce his time at Central Districts to ‘he got on a trading card’ is flippant, unfair and leaves the reader with a negative impression. The friendships he made at Central Districts are cherished, so much so he has made the trip back to catch up with old team mates. Son of a proud Central Districts Player. Luke, as per my email, I’ve updated Alan’s section to better reflect his extensive contribution to Centrals and footy generally. It was never my intention to give a negative impression of Alan’s time at the Dogs. Thanks for bringing this to our attention. Thanks for your “Blow Ins” run down on Centrals footballing outsiders. I had a great time at the Bulldogs with great memories -1978 – 1981 seasons – 69 games – I returned to Western Australia due my mother getting lung cancer. On return to WA I played another 57 games with West Perth – 1983 – 1985, when I dislocated my left ankle, which broke my ankle in three places when it snapped back into place and also broke my leg at the same time. This left me in hospital for 3 days and in plaster for 12 weeks ending my total league career of 130 games at the age of 28 . Played with John Duckworth at West Perth on return. I also played 4 games with Swan Districts 1975 to 1977. My first league game with Swans in 1976 included Garry Sidebottom who just passed away. I am glad he was playing for Swans. A great football talent, a hard man, a great team mate on and off the field. Thanks for the great memories. Cheers Mick OBrien – number 36. Thanks for letting us know about your time before and after the Doggies Mick.